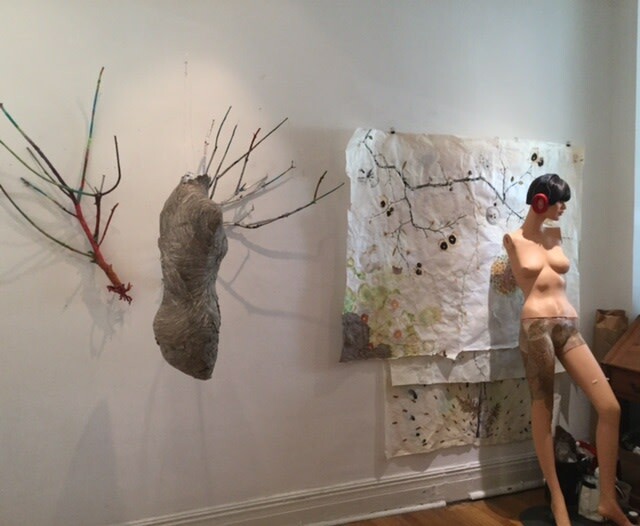 Marilla Palmer's mixed media works navigate the unexpected overlap of the organic and artifice. 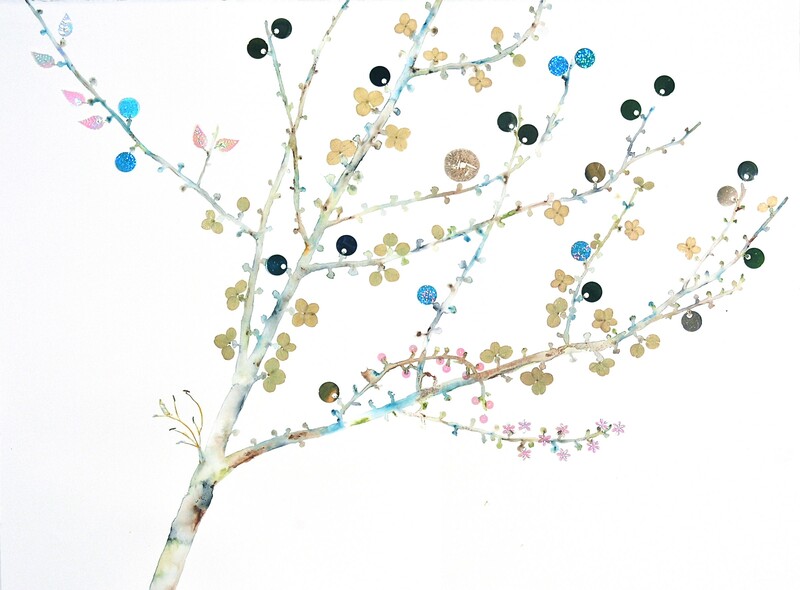 Dried flowers, foliage, and prints of spores are delicately combined with holographic paper, sequins, and wrappers to embellish renderings of found branches and plants. At first glance a celebration of the femininity of nature, upon closer inspection it's clear that Palmer is probing deeper. She selectively reveals the decay of her natural materials through the mask of her glamorous synthetics, questioning the power to fully transform through adornment. The worlds of the organic and inorganic — which are usually engaged in a battle for territory — come together to create a uniquely intimate portrait of Palmer’s surroundings. 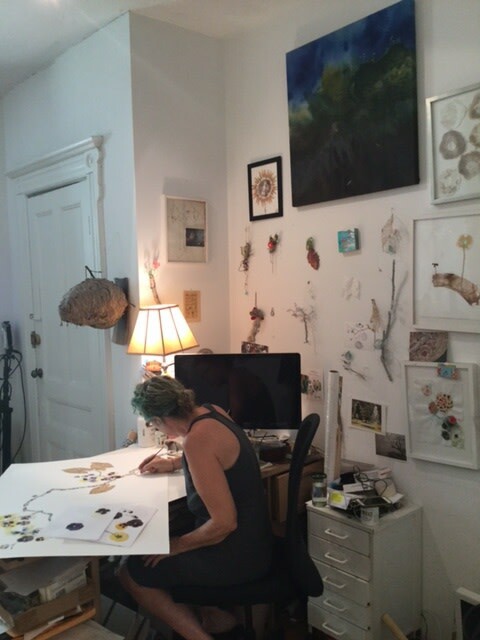 We headed to her studio in Brooklyn to discuss the challenges of being inspired by your environment, the intersection of nature and technology, and her reluctant path towards being an artist. There was always art, my whole life. My grandparents had a lot of Japanese art, since they met on a trip to Japan, so my earliest memory was probably seeing all of their art. When I was older, in middle school, my mother decided to be an artist. She might've been into the notion of being an artist as much as actually being an artist, but it was very difficult for women then to get ahead. We were living in Brooklyn Heights and she was part of this really interesting bohemian crowd of artists. It took a lot away from her ability to be a mom, though, which I really noticed, especially with my brother who was younger. So, at that point the last thing I wanted to do was be an artist. I didn't start wanting to be an artist until college. Was there anything in particular that provoked that? Yeah, there was. As soon as I got to college I met this woman who's still one of my closest friends, and she had just gotten back from an artists' colony in Greece, and every time she talked about it you could just tell it was this amazing place and I knew I had to go there. It was the Aegean Center in Paros. It was there that I first became an artist. Were you drawn to the style and the techniques that you're using now right away, or was there an evolution towards what you're working on now? Looking back at it, I was really drawn right away to the connection between art and nature that you experience when you go to Greece. Paros is where Parian marble is from, which is what some of the finest Greek sculptures are made of. There was this connection with how that marble was coming out of the earth and was part of this ancient history. 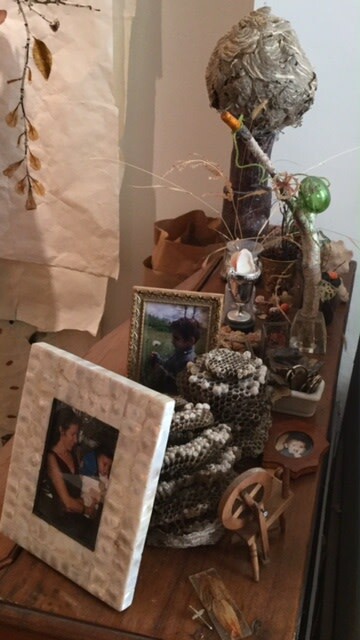 So right at the beginning of my personal practice, I was feeling very connected to the earth and to nature and the history of that relationship. 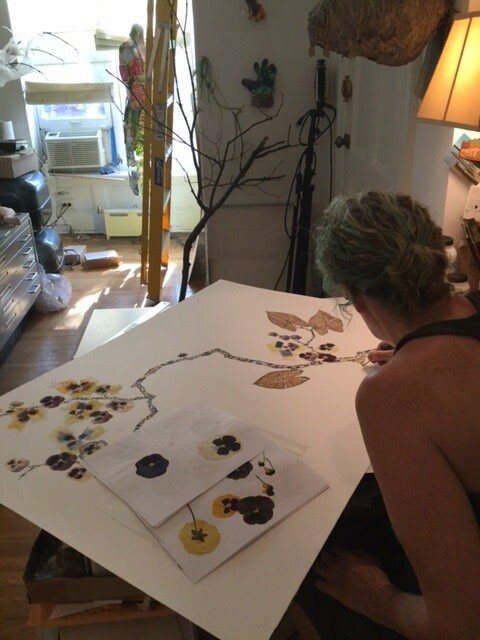 Then fast forward decades and decades of trying to be an oil painter and doing installations and lots of other things, and I start doing this work where I was using fungus and pressed flowers and drawing from shadows of branches and shadows of plants. It was much more connected to that initial spark. 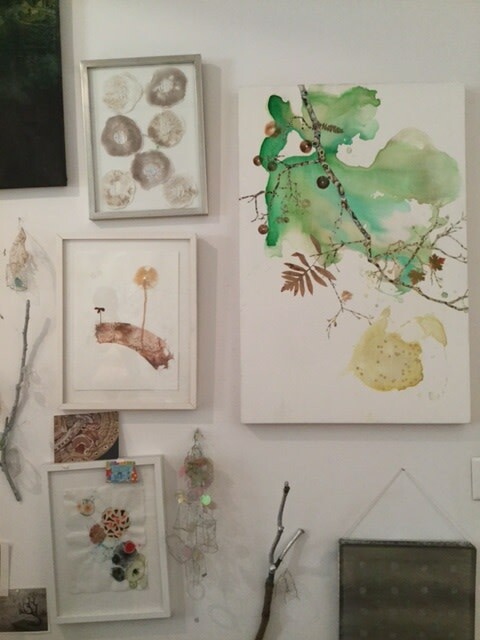 I can see, now, that's when I finally connected to that thing about art that I love the most, which is my process and going out in nature and growing things and picking things up to use in my work. Where do you find the materials that you work with? 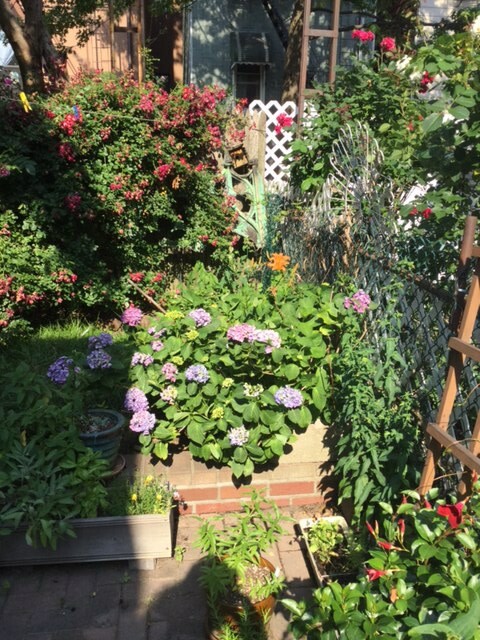 I have a garden that changes all the time throughout the seasons that's a constant resource for me, but I collect things all over the place. I was recently in Mexico and I picked so many things there. There's what's called the flame tree and it has the most incredible flower and it was in bloom while I was there, so I picked a few flowers. I can grow some smaller tropical plants in the garden in the summer, but there are a lot of things you can only get in tropical places that I love to use. What would you say that you're exploring in your work? I really strongly believe in environmentalism and I wish I could do more to help. If I had a lot of money, the first thing I'd do is buy up hunks of land in the tropical zones and just leave them with nothing on them. I think it's so important to save the environment, and to appreciate what we have. I want people to look at what I do and to look at nature in a new way and hopefully they'll appreciate it more. But there's also this other side to it, where I combine bits of holographic paper or sequins, and they represent more of a technology, because I do feel that the way forward is nature combined with technology. It's just the reality. We're probably not going back to a primitive way of living. The future is going to involve finding ways for nature and technology to coexist. Could you talk a little more about the process of how you incorporate the synthetic materials with the organic materials? How do you balance those elements? To me, nature is just so spectacular. Even in front of our house there's this beautiful little red petunia that just grew by itself; a bird probably dropped the seed there. Or something as cliche as a sunset. That's just so incredibly special and amazing to me. But you can never ever create the excitement of seeing that in an artwork, in my opinion. There are masterpieces that get there, of course. I just saw the room of Turners in Met Breuer and they're drop dead gorgeous and incredible. But for my practice, I just feel like you have to do more. So what can you do? I can paint and then I can add patterns to the bark and then add colors, but that's not enough. So then I use the real foliage, but that's not enough. So then I try using velvet or sequins or glitter and I just do whatever I can to try and make it even approaching as spectacular as nature is. I want to capture that excess of the experience of being awed by nature. What inspires you to start working? Is there something in particular or do you just sit down and work and see where it takes you? 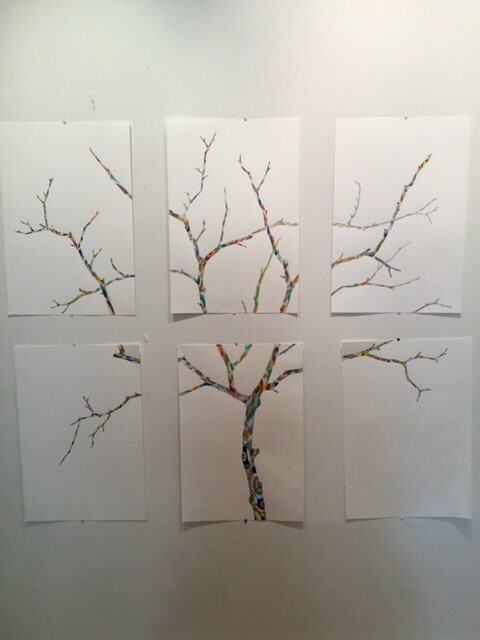 I'll see a branch or other piece of nature that I'm particularly drawn to and work to create a piece around that. Or I'll see a pattern that I'm inspired by. This piece that I'm working on here, the pattern on the bark is influenced by Sonia Delaunay. I am extremely influenced by the Rinpa school of art, which is a Japanese school of art focused on capturing nature. Those images are spectacular and I try to capture the spirit of them in my work. How would you say that your work is evolving at the moment? I have a number of ideas of new types of trees and types of patterns that I want to work with. These pieces don't come that quickly; they take quite a while. So I'll focus on working with one idea for some time before transitioning into something else. I like working with things that are undervalued. Trees are undervalued, and one of the most undervalued trees is the palm tree, so I'm looking to do some work with palm trees at some point. I took a lot of photographs of them while I was travelling recently. I hope that I can play a little bit with the cheesiness of them, but go past that. That'll be in a couple of months. 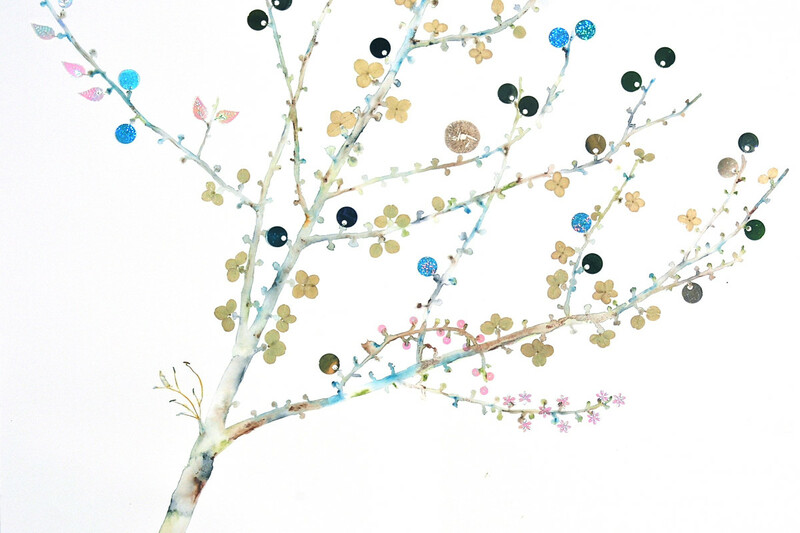 Explore more of Marilla Palmer's work here. Her recent works will be on view at our Bridgehampton gallery from June 23rd through July 10th.